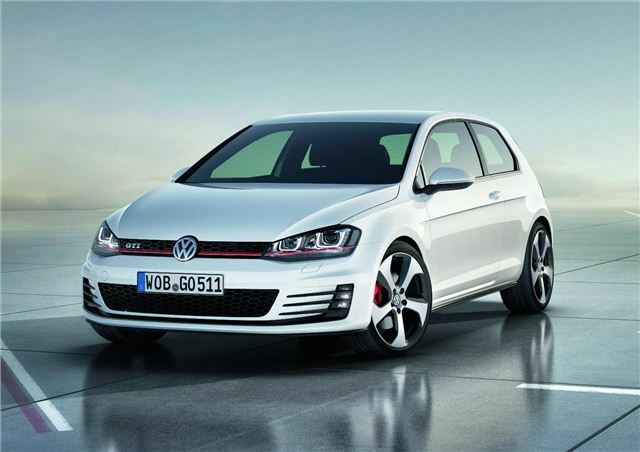 Volkswagen has previewed its new Golf GTI at the Paris Motor Show. The show car is called a concept, but it’s not likely to change much before it goes on sale in Summer 2013. It’s powered by a 2.0-litre turbo engine with 220PS, but it’ll be available with 230PS if buyers choose a factory performance pack, which also enhances handling and brakes. Both a six-speed manual and seven-speed DSG are to be offered. Acceleration from 0-62mph takes 6.6 seconds and top speed is 155mph – impressive figures. Even more impressive is the fuel economy – the official average is 47.1mpg an improvement of 18% over the old model. A variable ratio steering system means drivers get direct and immediate steering on country roads with no adverse effect on low speed manoeuvres and town driving. The steering wheel itself has a flat bottom. The cabin gets traditional GTI tartan seat trim, along with a golf ball gearstick red ambient lighting. Outside the car gets the usual red grille stripe but now it goes across the bottom of the headlights, as well as red brake calipers and smoked LED light clusters. Official UK specification and pricing will be announced ahead of the on sale date in Summer 2013.